Our trademarked oil-free enclosure systems offer the lowest noise levels in the industry. Each system is packaged in a rigid steel frame with powder coated panels and lined with sound-deadening insulation. The low noise levels are unmatched in the industry and allow installation at the point of use, while the small footprint simultaneously maximizes floor space. Downloadable CAD and Revit Drawings coming soon! 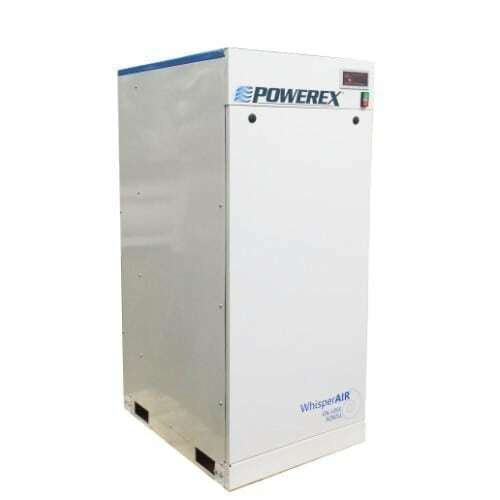 With the Powerex Variable Pump Drive system, each compressor pump is automatically staged on/off individually based on actual system demand, maximizing energy efficiency at all usage levels. 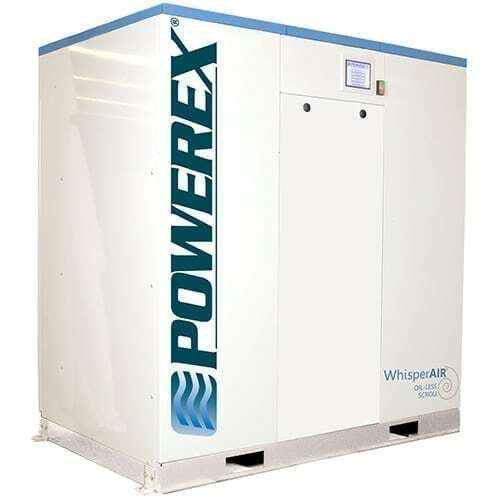 Lead compressor status will alternate every time a pump is called for – or every 10 minutes, whichever comes first – which maintains equal run hours and extends maintenance intervals. Redundancy is built into our system with our multiple pump design, eliminating the need to purchase an additional compressor.